As we all know, providing customers with top-notch service is a priority for all organizations. Customers today expect immediate assistance and a seamless experience across digital channels when working with their “go-to” companies. As AI steps into the spotlight, organizations need to establish a harmonious transition from AI to customer support agents. This tight integration ensures that companies meet customer expectations and provide the best experience possible, bringing customers back for more. 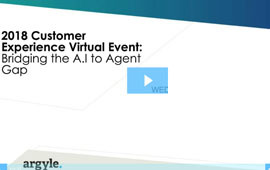 In this Argyle Executive Forum, in partnership with Bold360 by LogMeIn, we discuss bridging the gap and establishing harmony between chatbots and customer service agents.